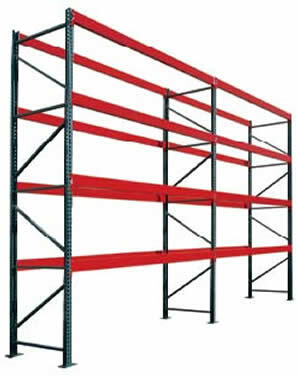 Since 1999, the Jaken Company has been manufacturing boltless shelving in addition to a variety of material handling products. Among their newest products are the FastRak Record Archive Shelving and the FastRak Tire Storage Rack. Jaken takes the time to ensure that every product they produce is of the highest quality, while still at an affordable price. Jaken also offers exceptional customer service. Their knowledgeable staff consistently provides support in a prompt and courteous manner. Most industrial applications require their areas to be safe and secure which means only authorized members can access their machines. The Jaken mesh panels are in accordance with the Machinery Directive and provide the highest personal and machine safety. Jaken is a very popular brand around the world in machine guarding and security amongst the production industry. Jaken system has been tested to be compatible with new and old modules. Uprights for the pallet rack can be shipped already assembled for an addiontal fee per upright. The FastRak Bulk Storage Shelving is perfect for storing bulky and heavy items, with a heavy duty upright that can be “knocked down” for faster shipment. 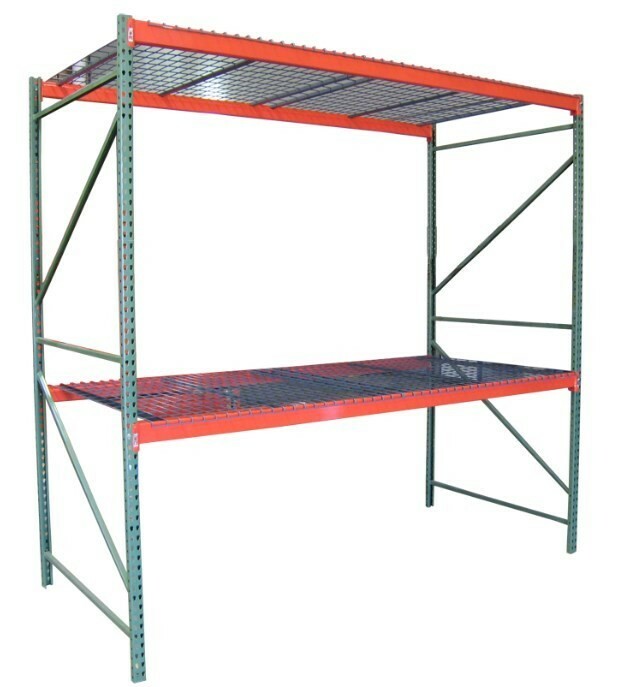 This shelving comes with the choice of wire mesh or particle board decking for the shelf surface. 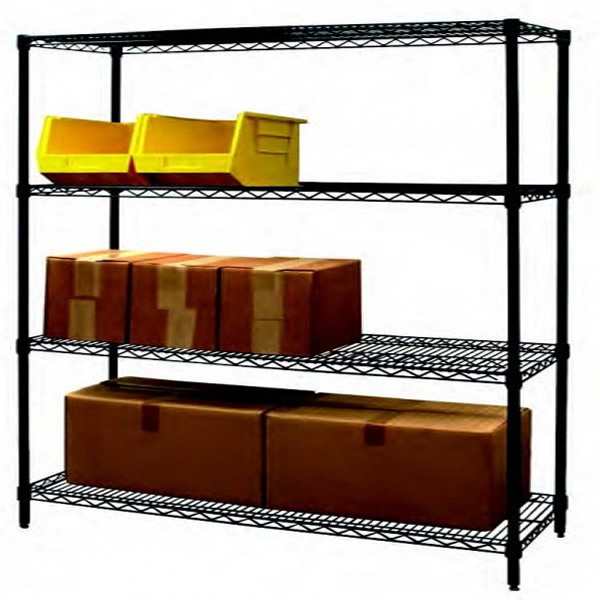 FastRak Bulk Storage Shelving is especially unique because a shelf at the bottom of the unit is not needed, allowing items to be placed directly on the floor. Model Number Size Qty. Model Number Size Qty. Boltless Shelving is high capacity and makes use of Double Rivet Beams, which increases the capacity of the shelf while also allowing for many applications that have a wider span. 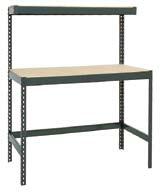 Each boltless shelf is composed of heavy-duty steel and features the Series 200 boltless design. This particular design allows for simple installation without nuts, bolts, or shelf clips. Standard boltless shelving units come with three adjustable shelves, but extra shelves are available for purchase separately. Single Rivet Beams are used with this shelving to make the most of the available storage space. The Series 200A Low Profile Shelving is exceptionally easy to install as it does not require nuts, bolts, or shelf clips. 4 Ft. Width 48" x 12" x 84"
48" x 18" x 84"
48" x 30" x 84"
48" x 36" x 84"
5 Ft. Width 60" x 18" x 84"
60" x 18" x 84"
60" x 24" x 84"
60" x 30" x 84"
60" x 36" x 84"
60" x 48" x 84"
6 Ft. Width 72" x 18" x 84"
72" x 18" x 84"
72" x 30" x 84"
72" x 36" x 84"
72" x 48" x 84"
7 Ft. Width 84" x 18" x 84"
84" x 24" x 84"
84" x 30" x 84"
84" x 36" x 84"
96" x 18" x 84"
96" x 24" x 84"
96" x 30" x 84"
96" x 36" x 84"
96" x 48" x 84"
4 Shelves 36" x 12" x 84"
36" x 18" x 84"
36" x 24" x 84"
48" x 12" x 84"
60" x 12" x 84"
5 Shelves 36" x 12" x 84"
6 Shelves 36" x 12" x 84"
Extra Shelves 36" x 12"
This original Z-Beam design allows for maximum storage ability. This particle board decking sits flush with the very top of each beam. The Black Z-Beam Shelving is sold and measured by units as well as components. With each complete unit, you will receive five shelves and particle board decking. 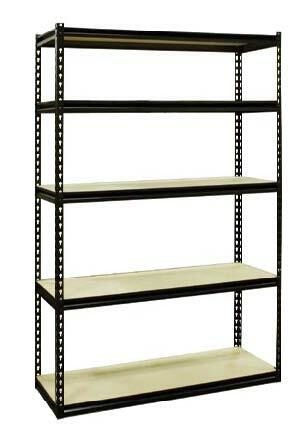 48" x 12" x 72"
The Modular Steel Shelving has a unique design which allows for several varying set-up configurations. 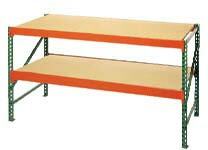 There are two possible set-ups to choose from: a single 72” height shelving unit, or two 36” height work-centers. Either option can be assembled in minutes, using no nuts, bolts, or shelf clips. Each shelf does include particle board decking. 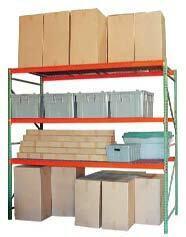 Bulk Storage Shelving is comprised of three heavy-duty shelves which can each hold up to 750 lbs. It is extremely easy to assemble, and the unit comes completely packaged and ready for quick-shipment. 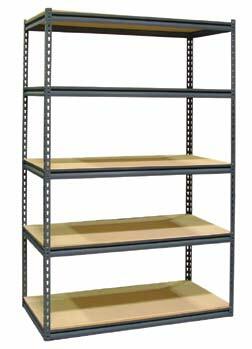 In order to meet your exact needs, Wire Shelving Components can be purchased individually. Each shelf is adjustable by 1” increments, and is available in a wide assortment of sizes. 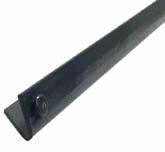 The stationary posts each come with an adjustable leveling bolt which makes up for any uneven planes. Each component is available in a black powder coat finish or chrome-plated. 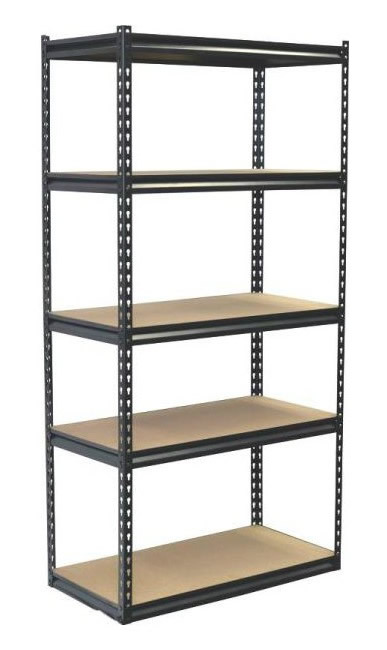 All chrome and black wire shelving are certified by the National Sanitation Foundation. Both of these units are available in 63", 74", and 86" tall units. Each cart has a durable chrome plating finish with an open wire design. The carts are extremely steerable, and easy to assemble as no special tools are required. Each unit is composed of rust resistant chrome plating and requires no special tools for assembly. The open wire construction of these units prevents dust build-up and encourages circulation of the free light and air. This unit has high durability thanks to the powder coated paint finish. The Black Powder Coated Mobile Units are extremely well-designed. Each unit has an open wire design, comes standard with four 5” locking swivel casters, and has a powder black coated finish, which is both chip and scratch resistant. 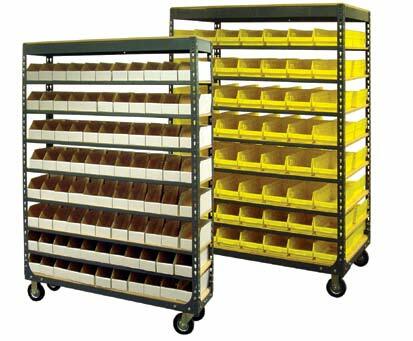 The Heavy-Duty Cantilever Rack is the perfect solution for storing bar stock, tubes, or any other long materials. In order to create a free-standing starter unit, two bases/columns, one brace set, and one set of arms are required. If desired, additional sections can be purchased as add-ons to the starter unit. Each component is sold individually. 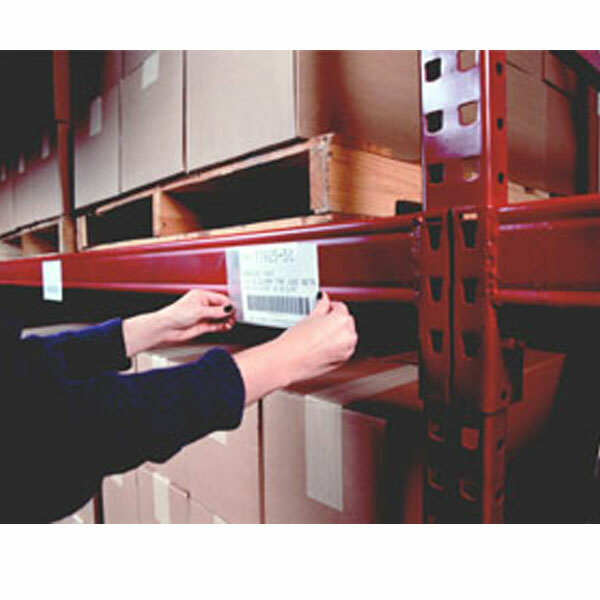 The Medium-Duty Cantilever Rack provides both secure and safe storage for all types of extra-long stock. Each unit can be assembled in less than 10 minutes. Each of these stackable bins is essentially indestructible, made from heavy-duty polypropylene with lasting molded-in color. They are water, rust, and corrosion-proof. Each bin has finger grips that allow for easier handling, and reinforced ribs to prevent them from collapsing under a heavy load. Typically, these bins are used in the areas of production, assembly, manufacturing, and repair. The bins are available for purchase in nine different sizes and three different colors (blue, yellow, and red). Each Jumbo Bin Storage Unit comes with a series of bins that are made up of heavy-duty polypropylene, allowing them to be resistant to water, grease, and oil. These units are efficient as well as being a cost-effective way to store small, medium, and large parts. With a simple, quick assembly, thanks to the heavy-duty industrial boltless design, these bin storage units will provide years of reliable service. Each bin is available in blue, yellow, or red. These Free-Standing Bin Storage Units are the ideal solution for a simple and quick way to store small and medium parts. Each bin can be easily removed from the storage unit and used to transport small and medium-sized parts to work areas. 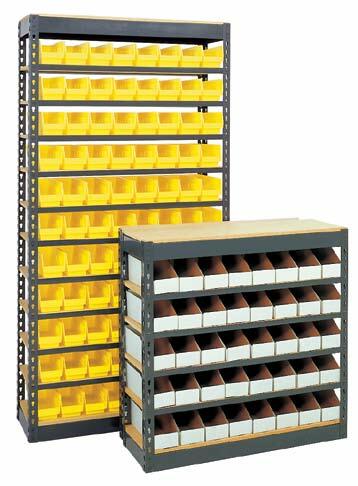 These units are perfect for use in an assembly/production area. Each Plastic Bin is composed of injection molded polypropylene, making them incredibly durable, and resistant to oil and grease. The bin cups are designed to fit into all plastic bins. Each plastic bin is available in yellow, and the bin dividers are available in black. Corrugated Bins provide an extremely cost-effective way to organize and store small, loose parts. Each bin is composed of 200 lb. tested corrugated board. The bins fold together quickly and are ready for use in mere seconds. Each carton comes with 100 bins. Each Bin Shelving Unit is highly efficient and are made up of either polypropylene or corrugated material, and are perfect for organizing small parts. Bin storage units come in 36” height with 6 shelves, or 72” height with 12 shelves. 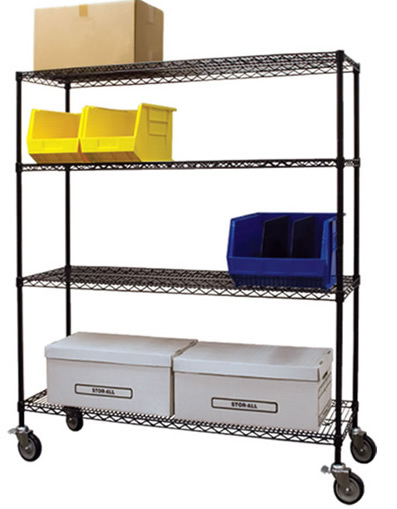 6” x 18” x 4"
These Heavy-Duty Mobile Shelving Carts are ideal for the transport of bins to work areas. They are made of heavy-duty material and come complete with either plastic or corrugated bins. Each unit is available for purchase as single or double-sided. 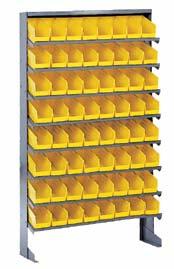 Perfect for categorizing small parts, these Pick Racks have angled shelves that allow for excellent visibility and easy access to supplies and parts. The Record Archive Storage Units utilize heavy-duty boltless shelving which allows for easy access to file boxes from either side of the unit. Each unit is available with or without ½“ particle board decking, and has a powder coated grey finish. The archive storage boxes are available separately. The Individual Archive Boxes are available to order with a 15" depth or a 24" depth. 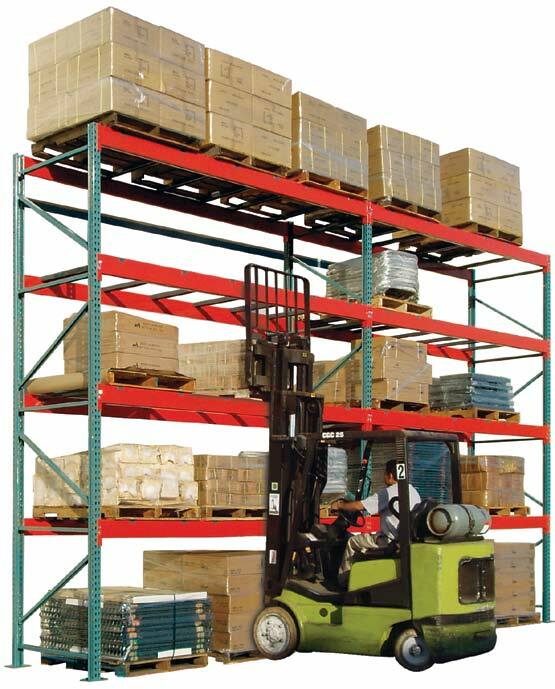 Service Carts and Platform Trucks are an excellent method of transport for small and heavy items alike. With a large variety of carts and trucks, Jaken is guaranteed to have a transport unit to fit your specific needs. W x L Caster Size Model Number Weight Cap. 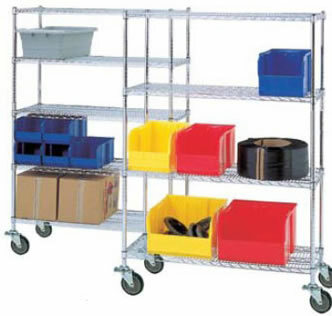 17” x 27” 22” x 34” 4"
Mobile shelf carts are highly efficient and well designed, composed of heavy-duty steel. The shelves can be installed with flange-down for tray style or flange-up for deck style. These convenient Mobile Workbenches will allow you to save time and money. Each bench can support up to 600 pounds, and comes with two 5” swivel casters and two 5” rigid casters. 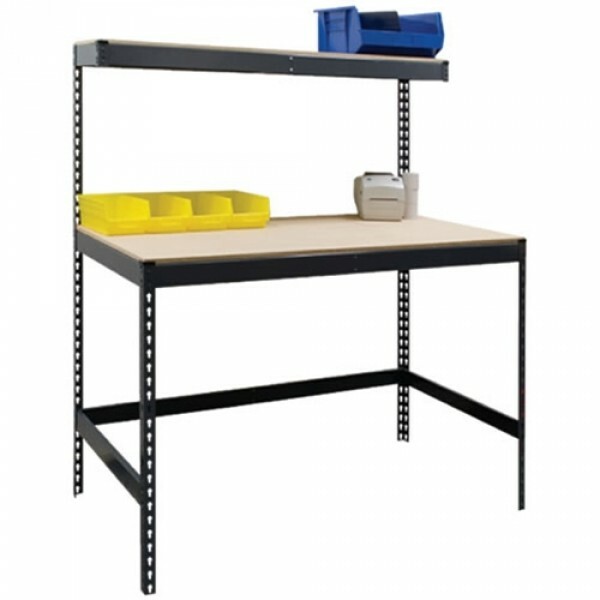 The mobile workbench is 36” in overall height, and has a powder coated grey finish. Each of these units is exceptionally easy to assemble and comes in a wide variety of sizes, designed to fit your exact needs. Each work surface is 36” high and comes with raised shelving that is 24” above the work surface, and 12” deep. Particle board decking is optional for each unit. The FastRak Workbenches are perfect for all types of heavy-duty applications, including shipping/receiving, assembly lines, and workshops. 48” x 48” 2000 lbs. 96” x 48” 1600 lbs. Reel Racks are completely welded and extremely adaptable, and designed to handle heavy amounts of weight. A row of racks can be created by purchasing “Add-On” units. Entire Unit Capacity is 4,000 Lbs. 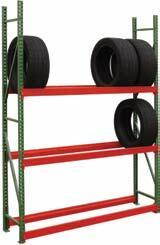 Tire Storage Shelving comes with an extra heavy-duty design and is ideal for storing oversized tires. FastRak Tire Storage Shelving easily accommodates rims that are 16” and larger. 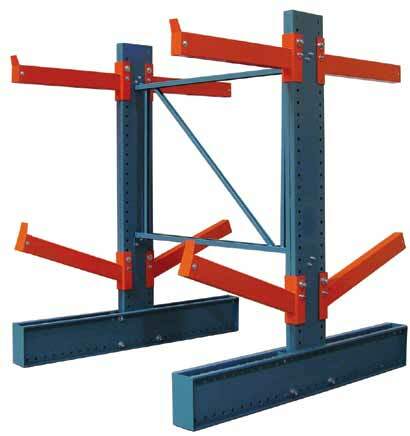 There are two types of stock racks: Vertical Stock Racks and Horizontal Stock Racks. 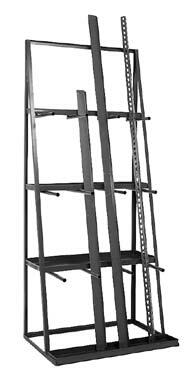 Both types of stock racks have a powder coated gray finish. Each Pair of Arms Can Support Up to 100 Lbs. Unit Weight is 60 Lbs.